PR is one of the best ways to build visibility for a corporate brand while getting the word out about a given product or service. And a fundamental part of any effective PR campaign is a healthy focus on executive visibility. These days, business leaders can’t afford to sit on the sidelines and simply run their company with the expectation that their PR team will do the heavy lifting. A C-level executive is the face of the company and often its brand. They must be willing to share business advice, comment on key trends affecting their category, and use their position as a platform for communicating expertise on an industry-wide scale. 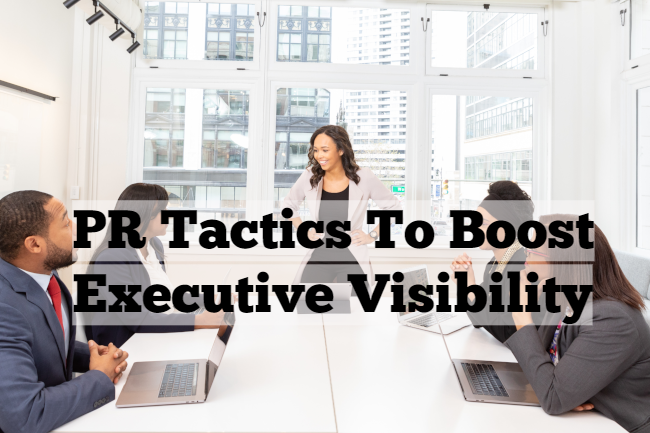 Here are some key tactics for PR pros to build executive visibility and thought leadership. Executives should be seen as thought leaders – first and foremost – by the journalists who cover their industry. This usually doesn’t happen overnight. PR teams need to be vigilant in identifying opportunities for business leaders to weigh in on relevant news and issues. Whether it’s a reactive pitch about Amazon’s effects on a startup ecosystem or a proactive push about a company’s unusual approach to online marketing – execs should always be using the media as a platform to educate relevant audiences. A leadership campaign should include a robust bylined content program. PR pros should consistently make inroads for executives to become regular contributors to both trade and mainstream publications. These opportunities give executives a range of content to use as a way to address customer concerns, offer fresh ideas, or introduce new thinking to the industry. They also help shine a light on the personality behind the exec, positioning them as someone with a compelling point of view. Once an exec has established a cadence for generating proactive opinion pieces, they can be leveraged for internal blog content, made actionable through a growing Medium page and posted to LinkedIn to encourage dialogue among other professionals and showcase expertise. See this post for tips on writing stellar executive bylines. Speaking at events and conferences is another excellent way for PR teams to build executive visibility. Conferences must be relevant and the subject matter should play to the core strengths of an executive’s abilities as a brand ambassador. If done right, this strategy can drive both visibility and credibility, while giving execs a chance to network with other like-minded business leaders or prospects. See this earlier post for tips on getting speaking engagements. We live in a world where social media can make or break a business. These days brands tweet like real people, and certain business leaders have created cult-like followings. As PR campaigns become more integrated, social media is a larger focus for more effective executive visibility. Yet research tells us that 70 percent of Fortune 500 CEOs have no presence on social networks, and many of those who do aren’t very active. Technology executives and entrepreneurs tend to be more comfortable on social media, but others are simply gun-shy. PR teams should encourage business leaders to find their voice on social media as a way to boost a CEO’s personal profile organically. They should consider LinkedIn and Twitter, for example, to identify and connect with industry influencers, engage with customers and interact with peers. Social media – if used correctly – can humanize an executive and give the average joe a better understanding of the values and ethics that flow into a brand.